Step 2: Open youtube, and the video you want to make an animation from. 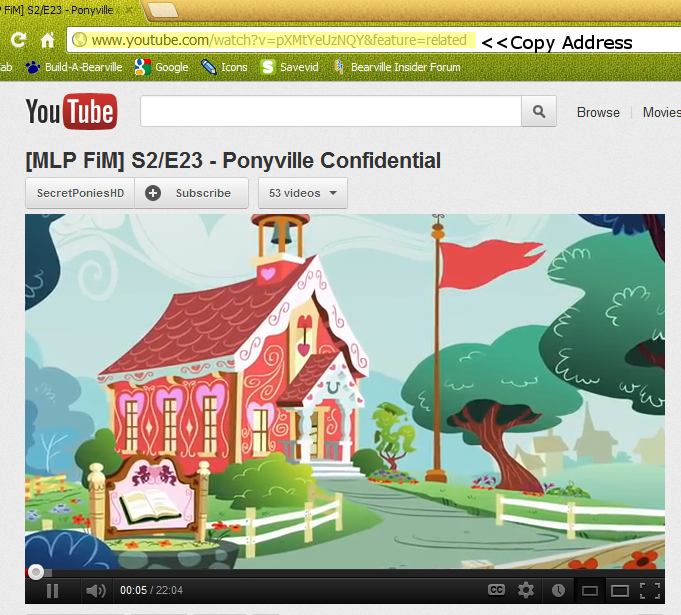 I'll be using a My Little Pony video. Step 3: Copy the address of your video. Step 8: Next, we'll start playing the video (Press ) . It will be a little slow at first because PS has to load up all the frames. 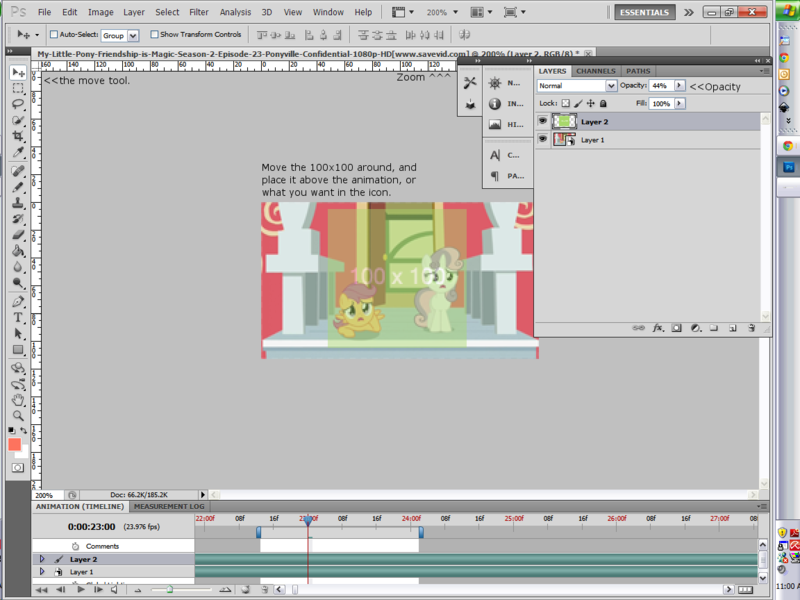 If you want you can go farther into thew video if you have a certain spot where you want to make the animation. When you see the start were you want to start your animation press pause (Press ). If you went too far, go frame by frame to find the exact place were you want to start (Press to go back a frame, and to go forward a frame). 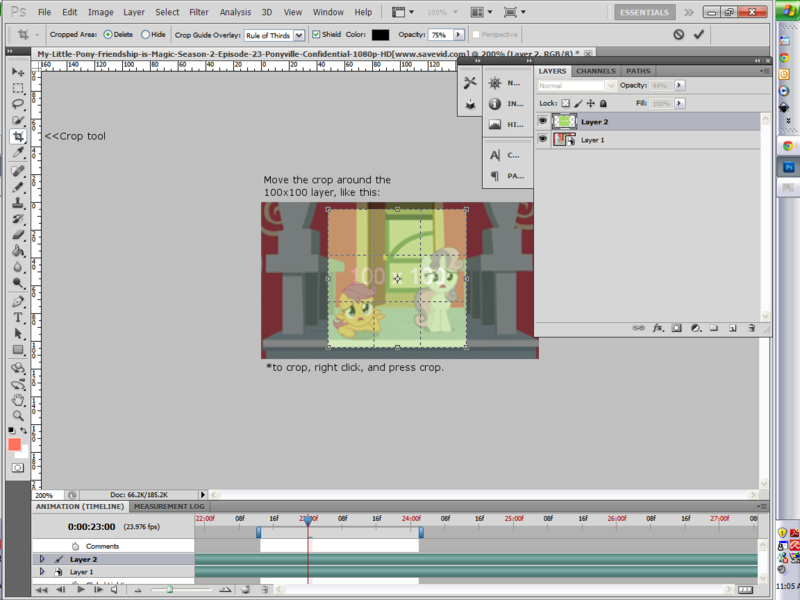 Step 9: Once it's in the exact spot, click in the top right hand corner of the animation timeline, then a menu will come up. Click "Set Start of Work Area". Step 10: Let's zoom in on our timeline. Move the little arrow to zoom. 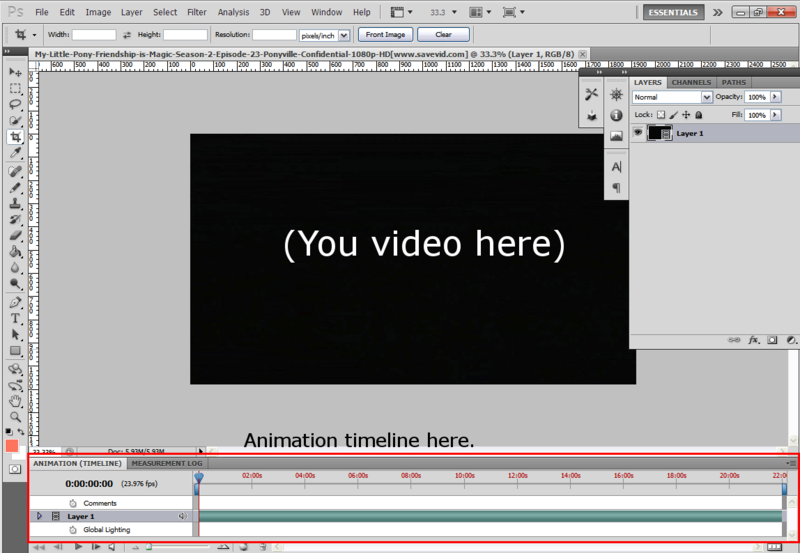 Step 11: Play the video again, and pause it roughly were you want the animation to end. Use the frame by frame buttons to figure out exactly where you want it to end. Step 12: Open the menu again (same as in step 9) and click "Set End of Work Area". Press play, to be sure it right. Step 13: Next, we are going to make the animation smaller. Go to Image>Image Size. First, lower the width to around 600-200. This is where we will have to experiment. I am doing 200. Since it will look to small, zoom in so you can see better (at the top, i suggest zooming 100%, or 200%). Use this, icon thing and copy and paste on your video. Open up layers and lower the opacity of it, so you can see under it, and the size. Use the move tool too move it around. If it looks right, and the animation you want in your icon is under the 100x100 picture, crop the 100x100 picture. If it isn't, then delete the 100x100, and keep scaling it smaller, and pasting the 100x100 picture till it looks right. If you make a mistake, you can always undo it. Step 14: Press play and let PS load up the layers. 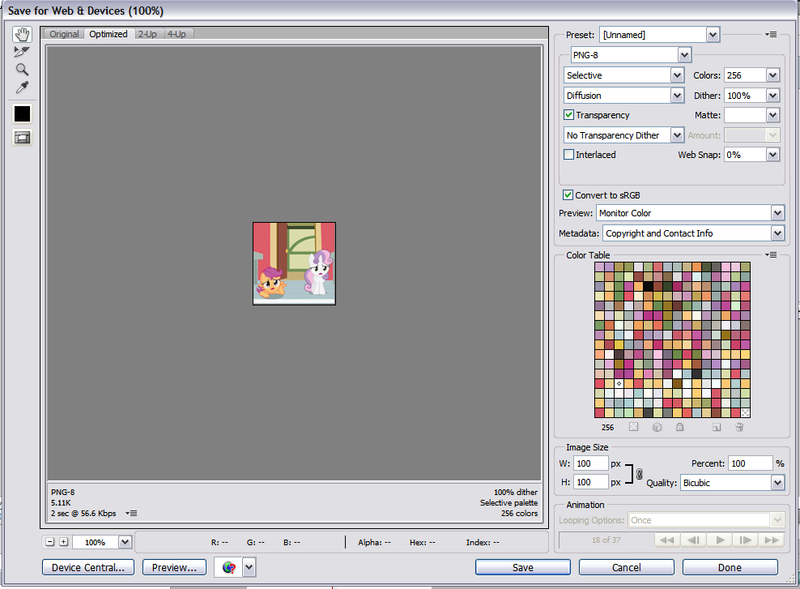 Step 15: This is the time to add any PSDs, or if you want to brighten up the image or add some contrast. Step 16: Now it's time to save our image. Go to File>Save for Web and Devices. Step 17: Now something like this should pop up. Step 18: Make sure it is set as a gif, so click PNG 8>GIF. If it already does say GIF ignore this step. Last edited by GabbyGirl88; 07-11-2012 at 11:42 AM..
Last edited by lauracamper12; 07-11-2012 at 11:42 AM.. I tried to get a picture for almost everything, just in case someone got confused. You did a good job explaining it, Gabby. Thanks for the tutorial,I'll go try it out! Thank you so much! the only animation i know is from animation frames so this helps a lot! i shall try this as soon as i am sure my ps doesn't crash my computer again xD but ty so so so much! When I went To savevid I pasted and hit download and it said error occurred. Are there any other videos just like it? I got a different vid,uploaded it to PS,but it said QuickTime 7.1 Version or later is required.. I do it a different way so it's good to have another way!